So we’ve covered deciding on a timeline, planning your route, and paddle in sites. Today it’s all about your gear, food, and making sure that you can carry it. When you’re planning a solo canoe trip its important to remember that everything you do is on your own. I know that sounds like a obvious statement but it’s true. You are the only one carrying all your gear, food, and canoe. You need to make sure that everything is thought out according to weight. The more you pack…the heavier it is…and the better chance you may have to make multiple trips on a portage. Your gear doesn’t have to be the latest in ultra-light gear. It just has to be efficient enough for you. As you’re going through those questions…another question might arise…how much does everything weigh? A 4-man tent will weigh more than a single-man tent. A single-man tent will weigh more than a hammock tent etc. My suggestion as you pack is to try on your pack every once in a while. What I like about this system is that it all fits together in the pot and is very lightweight. The best part is that you can shove it in your bag and it takes up very little space. If you’re going during the warmer summer months you may get away with no sleeping bag or just a lightweight one. I have an ultralight sleeping bag that rolls up pretty small. When it comes to canoes, lighter is better for a solo canoer. The main reason for this is because of having to carrying everything in one trip if possible on portages. You can use a traditional 2 seater canoe for a solo trip. It would give you room for your gear. You could also try out a solo canoe. If you don’t have access to one (friends or your own) you can rent one or test paddle one to see if it’s for you! No matter what gear you choose…it should all fit into one pack…to be slightly easier on your portages. Tonight I’m going to talk about food choices for your trip. Over the weekend we’ve walked through the process of planning a solo/or really any canoe trip. We’ve talked about setting your timeline, planning your route, choosing the right gear, and now we’re going to talk about making the right food choices. If you’ve read all the posts you’re going to notice something with how you choose your food. What you bring for food is going to depend on how long you’ll be on your trip. If you’re doing a week long trip, you’ll obviously need more food and food that won’t spoil compared to if you were going for an overnight trip. As your planning the menu you need to always keep your timeline in mind…especially if you want to bring fresh food/meat with you. Because you have no fridge/way to keep food cold long term, you have to be sure that the food you take is not going to spoil and make anyone sick. Your route will greatly dictate what you bring for food. If you are staying at one site during the whole trip then you may choose to bring some more food/beverages with you because you don’t have to unpack and repack every day. However if you are doing a loop then you may want to stick with lightweight dehydrated food. Again this is up to you but personally for me…I’d rather have my food be light and only require water to cook then worry about al l the ingredients that would go into preparing a meal from scratch. WHAT ARE YOU TAKING FOR GEAR? It doesn’t matter what tent you’re taking or what canoe you’re paddling…but it does matter how many cooking utensils/pans you want to bring and carry on the portages. For me…my Bugaboo Backpacker set works well…it has a frying pan, pot, straining lid, plus 2 bowls and 2 cups. As a solo paddler that’s all I need. If you’re going gourmet then you may choose to bring more with you. Making my own dehydrated food that I can vacuum seal and put in my pack without adding any weight. Even though I’m only doing one portage, weight is my primary concern. I don’t want to carry more than I have to. I hope this series has helped you out when it comes to planning your own trips! Stay tuned to the site as I add a route suggestions page that will not only tell you the routes but show them on the map as well. If you have any questions or need advice email me or comment on either the site or Facebook and I’ll be glad to help you out! Well Blogathon 2 is officially over. This weekend I’ve taught you how to start planning a canoe trip. What you haven’t seen is the things I’ve been doing in the background. I have worked on many aspects of this blog and the social media to go with it. Thanks for being my loyal readers and I look forward to sharing more adventures with you! So you’ve decided that you are going to do this canoe trip and you are excited to start planning but you have no idea where to start? That’s OK! Everyone starts off here :). You have a few things to decide first before you go headstrong into planning anyways. These are things we are going to discuss this morning! Not only can these be applied to a solo canoe trip, but all these posts can be used for any canoe trip! Have you done a canoe trip before? Is this your first solo trip? Is this your first time camping? 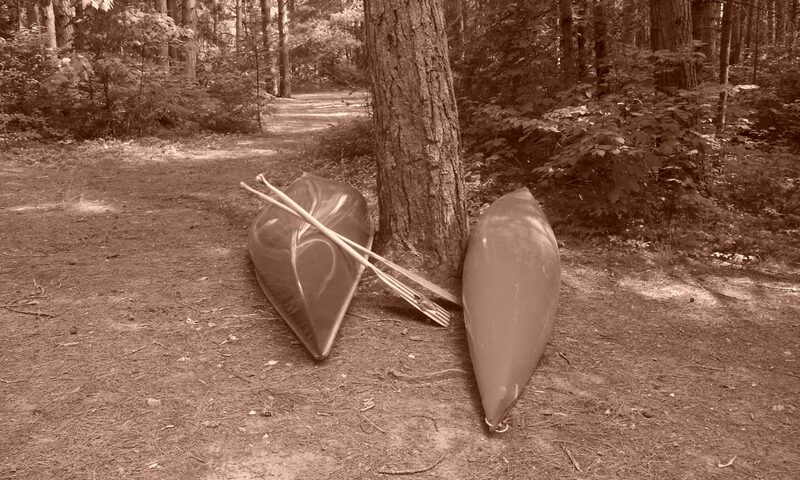 If you answered no to the first question and yes to any of the other questions then as a general plan you should look into the most basic of canoe trips….a paddle in site! So in all reality every campsite in the interior is considered a paddle in site but for our purpose I’m talking the ones that are attached to a campground or that have no portaging. Canisbay Lake and Rock Lake are the only two campgrounds along the Highway 60 corridor that have paddle in sites available. Each lake offers a different experience in terms of paddling and distance to the sites. The picture above is of Canisbay Lake. It’s a smaller and less windy than Rock Lake. The sites along Canisbay are great! The one at the far end of the lake (the last site on the left hand shore) is my favorite! It has a nice rock that you can jump off, a great campfire spot, and you get some gorgeous sunsets! It’s also the most remote of all the sites so it’s quieter! The Islands (if you can get them) are the best places to camp! Rock Lake is a different paddling experience all together. There are islands available for you to camp on, but be prepared that they are the most popular sites! Rock Lake also allows motor boats and because it’s attached to Galeairy Lake and Whitney you tend to get some slightly bigger boats than fishing boats. The thing about Rock Lake that I’m not the biggest fan of is that it’s a windy lake. Typically on the paddle out. You tend to head straight into the winds. Overall Paddle In sites are the way to go if you’ve never done this before or are just testing out your ability to handle sitting around the campfire talking to yourself haha. Because these sites are attached to campgrounds you can always do a one night trip and camp the night before in the campground. This is also great if you have a family camping trip and you want to try it while people are within an hours paddle away. That way if you can’t handle it or Yogi visits you…you have the option of going back. If you are a confident canoer and are ready to tackle the challenge of doing a portage solo then doing an interior canoe trip is probably your style. Before you go out on your own though, as a safety precaution, make sure you have a way to communicate with someone in case something goes wrong…better to be safe! Are you ok with portaging? How much does your gear weigh? Do you have a way to communicate in case of emergency? These are all things you need to consider. If you are embarking on your first solo trip but have only done a handful of other canoe trips you may not want to choose paddling up Opeongo and tackling the Dickson-Bonfield portage alone. You’ll want to stick with something simple like Canoe Lake to Joe Lake (see the pic above) because there is only one portage involved. However if you’ve been doing canoe trips for years with the guys and want to tackle a solo trip then you may be able to handle two or three portages. For me…to start out..the less portages the better! The other thing to take into consideration is the weight of your canoe and pack together. It’s one thing to have a super light canoe and a light pack…but once you add them together the weight can add up. Do you really need those three pairs of jeans? Do you need to put on your makeup out in the wilderness? Can you live without your pillow? Ask yourself these questions before heading out! So…we’ve looked at our options and we’ve decided the type of trip we’re taking…next post we’ll be planning the route. That post will be include a video so we can look at various routes. One of the most important aspects of planning ANY trip is when you plan on going. In my case…I’m going June 20-22. This gives me 3 days of paddling. Because I’m going on a Friday to a Sunday some of the major canoe routes may be busier than others so I plan on going up the night before so I can leave first thing in the morning. As I mentioned before we are going to plan our route. Before you plan any route though..you need to decide your timeline and how much you want to do on your trip. Hope this helps you guys with starting to plan your routes! What scares you the most about planning your first trip? Some of you may remember me participating in an event called Blogathon last year. This is a weekend long event that gives me the chance to update/work on my blog and social media. Last year I got a lot done…well really I completely moved my site to a new server :). I also did the pre-planning posts. This year my goal is to work on the Social Media Aspects of the site as well as give you a more in-depth look into my trip planning process as I plan my first solo canoe trip in June. I will also be creating a page dedicated to Route Suggestions. I’d love to hear from you about your favorite routes. This summer I’m planning to embark on my first Solo Canoe trip for my annual birthday trip. As scared as I am, I’m also very excited. What am I scared about? I think I’m scared the most about maybe not being able to hang my pack in the tree well/high enough. This is a legitimate fear as I really don’t want my food to disappear. Other than that I’m looking forward to it and can’t wait! I’m writing these posts to take you farther in depth in the planning stages when it comes to a canoe trip. Last year I did a pre-planning series including a video walk through. I’ll do that again but this time you’ll see me actually planning my trip step by step. The steps that I’m taking can be put towards your own canoe trip! The differences would be, you have a different route or timeline. After this weekend series I will also have a page up that will give you a variety of route suggestions that you can take into consideration for your own canoe trip within Algonquin Park. Whenever the Toronto Boat Show is on, you know that the canoeing season will begin soon! This is my second trip to the show and I must say once again I was blown away by the large amount of boats there! The Boat Show is not necessarily the place to go for canoes, however there are always one or two companies there to represent the industry. Swift Canoe, Clearwater Designs, and Necky Kayaks were there to represent the industry! As far as reveals go…Swift had something to offer everyone for the 2014 season! They unveiled their 2014 lineup at the show and as always…they did not disappoint! Meet this years members of the Swift fleet! This boat is by far my favorite! This streamlined pack canoe is extremely light and offers you enough storage space for the canoe trippers. It can also have a traditional solo canoe seat instead of the pack seat. Mike from Swift Canoe (and Badger Paddles) tells us more! The Northern Canoe line is the latest canoe line by Swift. This is for the recreational canoer who wants a canoe at their cottage or campsite. It can be used as a tripping canoe too. These canoes come with either an aluminum or vinyl trim and they have a shoe keel as well. The Fibreglass canoes weigh 68 lbs and the Expedition Kevlars weigh 54 lbs. The Textreme Carbon Fiber Hull is pretty cool! I love the checkerboard look to it! These canoes are ultra-light and extremely strong. The Textreme creates a sleek design that still gives you a remarkable strength:weight ratio. Clearwater Designs didn’t necessarily unveil a new Kayak or Canoe but they did unveil a new furniture line? Yes you read right! ClearWater Designs has created the ultimate recliner! Best of all, it floats! Made out of the same material as their recreational Kayaks, the chair and matching table are floatable. Owner Ian is demonstrating in the picture below :). Of course there were the usual ski boats, yachts, and seadoos there too! Well that’s it for the Boat Show. Next up is the Biannual Blogathon in a week and a half. After that it’s the Outdoor Adventure Show.